Points Nécessaires : 4200 Veuillez noter que, pour l'instant, vous ne pouvez pas télécharger du contenu à partir de notre plate-forme directement sur un appareil mobile (téléphone, iPod, iPad, tablettes ...). Vous devez télécharger vos articles sur un PC ou un Mac, puis de les transférer sur votre appareil de façon normale. Nous travaillons à autoriser le téléchargement direct aux périphériques mobiles, mais ce n'est pas possible dans la version actuelle de la plate-forme. Désolé pour le dérangement! EARLY ACCESS GAMEGet instant access and start playing; get involved with this game as it develops.Why Early Access? “In terms of units and available technology, the game is very close to completion. Early Access allows me to listen to the players, balance the existing content and provide new content based on the feedback. During the Early Access period the game will most certainly contain bugs, … glitches, and issues that can impact the game experience. If you do buy the game and come across something odd, please let me know in the Community Hub discussions!”Approximately how long will this game be in Early Access? “The estimate is that Meridian: Squad 22 will be in Early Access for ten weeks.”How is the full version planned to differ from the Early Access version? “The full version will contain all campaign maps, all squad missions, as well as a finished Conquest mode.”What is the current state of the Early Access version? “The game is currently in a good early beta state with most units and technology already available, but with most campaign missions and the squad missions game mode still in development.”Will the game be priced differently during and after Early Access? “There will be a set price for early contributors, the price will go up to standard pricing on the second major milestone update. On full release, the price will only slightly increase with a discount available on launch.”How are you planning on involving the Community in your development process? “I'll be engaging with the community throughout Early Access on the Community Hub. Story-mode is an important aspect of Meridian, and Conquest mode is a highly ambitious project in itself, which is why I need the community's help to polish both until it's good to go!”	NOTICE: Activation key must be used on a valid Steam account, requires internet connection. ABOUT THE GAME	Humanity is in peril. The first colonization attempt of mankind has failed and the colonist crew is missing. The leaders of the United Earth decide to send a highly trained specialist squad to planet Meridian to find the crew and bring them home safely. 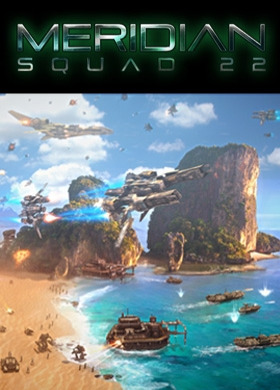 Meridian: Squad 22 is a single-player science-fiction real-time strategy game with a focus on base building and advanced tactics. Every single choice, every tactical decision you make, shapes the outcome of your story. Will you take the offensive route or stay on the defensive? Will you consider the lives of your crew a priority or will you sacrifice them mercilessly to gain the upper hand? Ede Tarsoly, the lone developer behind Elder Games has teamed up with Hexany Audio, the award-winning sound design team, to bring you an experience like none other with unparalelled fidelity. KEY FEATURES Control the fate of Squad 22 and the colonists in the 10+ hour story-mode campaign	Vanquish your foes on planet Meridian in over 100 procedurally generated missions in Planetary Conquest	Polished, dynamic and fluid unit control	Over one hour of immersive music	Fantastic sound effects brought to you by an award-winning sound design teamSYSTEM REQUIREMENTS MINIMUM: OS: Windows Vista / 7 / 8 / 10 Processor: 2Ghz dual core Memory: 2 GB RAM Graphics: nVidia GeForce 8600 GT / ATI 2600 Pro DirectX: Version 10 Storage: 5 GB available space Sound Card: Any	RECOMMENDED: OS: Windows Vista / 7 / 8 / 10 Processor: 2Ghz quad core Memory: 3 GB RAM Graphics: nVidia GeForce GTX 275 / ATI Radeon 4770 (or higher) DirectX: Version 10 Storage: 5 GB available space Sound Card: Any Meridian: Squad 22 developed by Elder Games, published by Merge Games Ltd and Headup Games GmbH. © 2016. Meridian: Squad 22 and Elder Games are trademarks or registered trademarks of Elder Games. Merge Games is a trademark or registered trademark of Merge Games Ltd. Headup Games is a trademark or registered trademark of Headup Games GmbH & Co. KG.